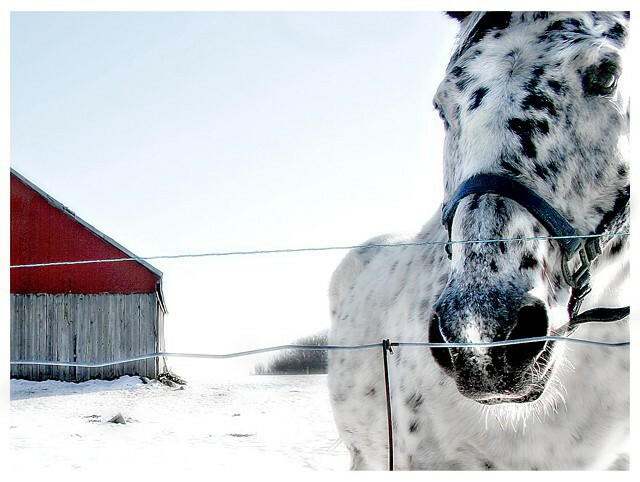 Really love this bold composition, and how my eye moves from the horse to the barn to the trees beyond. Such a superb image. COngrats on the top 10 - I wanted it to win a ribbon. Message edited by author 2006-02-06 02:26:55. Well done on your top 10 finish! Great photo! Congratulations on your top ten finish with this lovely presentation. love the red against the rest of composition. So close dude. Incredible finish on a breathtaking image. Well done!!! Message edited by author 2006-02-06 10:49:26. Very nice photo , with only 3 colors you have made a lovely composition. that bit of red makes this shot..great composition..
Great angle. I love how bright and detailed everything is. I think that this would have been stronger if you had cropped out the barn. Great shot and composition. I love the textures in this photo and the light on the horse's chest. Nice work. You could have done a different cropping, but I am glad you didn't even if you had the opportunity. This isn't just a subject off centered, but off centered in a unique and interesting manner. I also love the color combination. There is a contest being discussed on red/white/black. Not sure if it's your idea or not, but this would be great for it. Love horses and wildlife shots. A 9. Half the horse and half the house in a frame. Courageous framing: +1 in my votes. However, doesn't quite work for me for some reason... I think the wire fence, cutting the hource's face into three parts is what is bothering me. Stunning work. Love how you've kept each subject in focus and off centered. Great job! Proudly hosted by Sargasso Networks. Current Server Time: 04/19/2019 12:48:34 PM EDT.